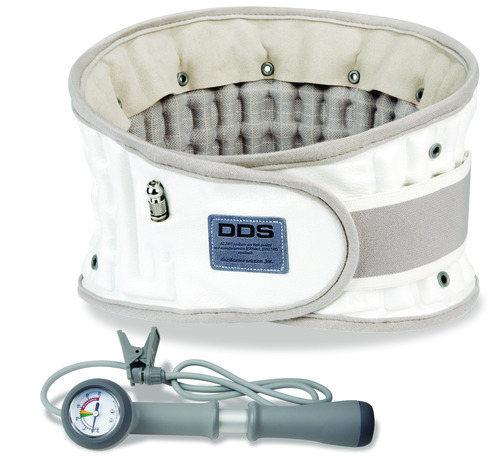 The DDS Spinal Air Lumbar Decompression Belt is an effective, noninvasive and simple-to-use solution for those seeking treatment for low back pain. Our Lumbar Braces are ambulatory, they have a 100% soft cotton lining, they are all machine washable and they can be worn discreetly under clothing. There have been numerous studies conducted including case reports, clinical trials and MRI’s proving the efficacy of our Lumbar Decompression Belts, drastically improving those with low back pain. Our Decompression Belts are Medicare approved and are covered by most private insurances as well. The function of the DDS 500 is scientific, precise and very simple. Spinal traction is being created as the brace is being inflated. The vertical air cell expansion mechanism decreases the axial loading while increasing the intervertebral disc space by anchoring up underneath the rib cage pushing upwards, and down against the pelvic girdle pushing downwards. This action gently stretches the torso vertically, diverting the weight bearing forces away from the discs and reducing the pressure within the lumbar spine region, significantly reducing pain levels while assisting active-rehabilitation. The DDS 500 is the perfect solution for patients who cannot tolerate the discomfort of a rigid body jacket yet require similar support. It is especially valuable for pre and post surgery, providing with equal stability as a stiff body jacket. As the patient progresses and requires less support, the detachable rigid panels can be removed to create a semi-rigid support with one or no support panels. It easily converts to a soft LSO and provides greater flexibility. Visit www.DDSbelt.com or www.DiscDiseaseSolutions.com for more information about our products and view Clinical Studies and Testimonials from Medical Professionals and Patients alike.